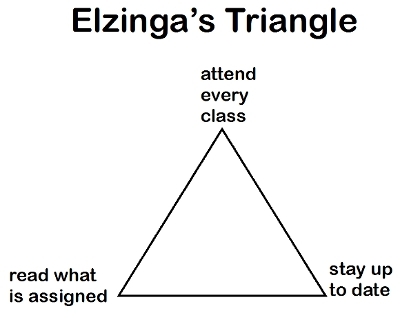 In July of 2003, I heard Professor Ken Elzinga speak to christian high school seniors about how to succeed in college. In addition to being an expert economist, Professor Elzinga is the Robert C. Taylor Professor of Economics at the University of Virginia and a very wise man. He has been teaching college students for over 40 years. Unfortunately, the talk was not recorded. Below are the notes I took. Good students rarely miss a class. If you attend 80-100% of classes you will get an A. It is statistically impossible to fail if you attend over 80% of classes. Where you sit in the classroom is the best predictor of your academic success. Try to sit in the first two rows. The syllabus is a contract between you and the professor. Start with the syllabus and do what is on it. Most people cannot do all the work in the last week. Most of the material is not that hard, there’s just a lot of it. Life outside the classroom affects life in the classroom. (Drugs, alcohol, promiscuity, abuse leads to failure.) Christian students do not drift away from Christ if they make time for church, make time for fellowship and make time for Christian service. The Gospel is an offense. People with academic authority will find you and your faith offensive. You need to learn not to be ashamed of the gospel. The Gospel is defensible. Very smart people who are smarter than your professors believe the gospel. The Gospel is True with a capital “T”. What you learn in the classroom is true with a little “t.” For example, you can’t anchor your life around the laws of economics and they are not worthy of your complete acceptance. The first month defines your next four years. Set your lifestyle from day 1 and choose your friends. It’s like being shot from a gun. You get on a trajectory that is very hard to change. But God can change it. Usually it takes until your third year to hit bottom. If you follow the wrong trajectory, God won’t redeem your grade point average and your life wreckage, but He will start from there and move you forward. Go visit and get to know your professors. You’ll need recommendations later. Don’t waste college; grow up. 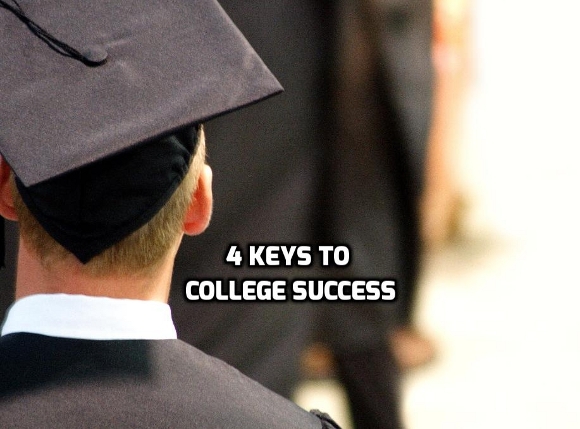 College is not a 4-year paid vacation. You are old enough to have a job. This is your last chance to be paid to learn. You are a Christian student. Not a Christian first and a student second. Not a student first and a Christian second. If you are in college, you are called to be a Christian student. Hang around with others who think like you do. Leave college with at least 1-2 lifelong friends. God cares about your mind and you develop your mind in the classroom. Remember God is the creator and the world is fallen. History will end. Spend enough time to attend every class, read what is assigned and stay up to date — and no more. You will have time left for friends, sports and activities.